If you would like to be featured on the LOERN page, please fill out the form corresponding to your role in open language education: OER Teacher, OER Master Teacher, OER Creator, OER Master Creator, OER Reviewer, OER Ambassador. We welcome multiple submissions from people who are active in different areas of OER! 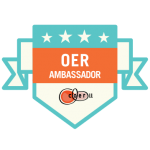 An OER Ambassador is someone who actively promotes foreign language OER by sharing and modeling various open educational practices (OEP): e.g. giving a conference presentation, networking in an open educational forum, writing an article or blog about OER, facilitating an OER/OEP workshop, mentoring a student or teacher about Open Education, etc. Gave three presentations addressing the development and use of OER. Wrote an article and book chapter (forthcoming) explaining OER and OEP. I have been working to develop an authoring tool that allows language teachers to publish free and open language textbooks. I have created OER resources and I have provided professional learning with OER resources. I created the Mixxer (www.language-exchanges.org), have submitted student mods of the game Civ V to Merlot, and written about openness. I research and present on various topics related to open education and L2 learning and teaching. Disseminates knowledge relating to OER/ OE in a number of PD workshops and incorporates found/modified/created materials into teaching. As moderator of the Français Interactif (FI) Facebook page, spreads the word about OER for learning French. Chairs the OER SIG, develops badges for open educators, presents internationally on OER. As the Community Moderator for COERLL's Heritage Spanish project, Jocelly shares her work and encourages colleagues to do the same. 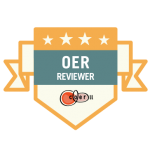 An OER Reviewer is a teacher who writes an evaluation or a review of an OER by another teacher in the language he or she teaches. Evidence can include proof of membership in an editorial board, or a review in a blog or a repository such as MERLOT, OER Commons, or Open Textbook Library (University of Minnesota). I was on a panel of reviewers for the State of California OER Review, a coalition of reviewers from CA public higher ed institutions. As a member of the FLLITE Editorial Board, I conducted a blind review of a participating student's lesson plan draft. An OER Master Creator is a student or teacher who creates an OER based mainly on original content. In this case, an OER is more ambitious than a single lesson plan and usually includes a set of materials, e.g., a set of readings or grammar exercises or even a thematic unit. All OER must carry an appropriate CC license. I created and maintain the OER textbook "A Foundation Course in Reading German"
Through an advanced language course I taught, I oversaw the development of an intermediate language textbook by 8 of my graduate students. I co-created an OER website for EAP students. I authored an online textbook titled Korean Through Folktales. I wrote a textbook called "CALL Principles and Practices" and shared it using a CC BY license"
I wrote a textbook called "Communication Beginnings: An Introductory Listening and Speaking Text for English Language Learners". I wrote a textbook called "Convivencia: Activities for Spanish Learners" and shared it by using a CC-BY-NC-SA license." I wrote a book in Farsi called "CALLing on MOODLE: Theory and Practice," and shared it using a CC BY NC ND license. I edited a student-created OER called the /Antología abierta de literatura hispana/ and shared it under a CC-BY license. I created a series of problem-based learning units for advanced students of Spanish. I helped with the creation of the SpinTX video archive. I created Vachiam Eecha in 2003 and then the Wiki for Indigenous Languages in 2011. I wrote materials to teach Spanish for heritage speakers at the college level. I created and co-authored a website called "French à la mode" and shared it using a CC BY license. I collaborated on writing some activities for the OER Empowering Learners of Spanish unit. I design curriculum to be used for Spanish teaching in the World of Learning program and convert it to OERs to share with other teachers. I wrote two open source units on History of Spaninsh and Intuitive Grammar for Spanish as a HL and shared it using a CC BY SA license. I wrote an open textbook, Le Littéraire dans le quotidien, and am co-director of the FLLITE Project. I assisted in writing of Yorùbá textbook 'Yorùbá Yé Mi' for open access. The material is an eye-opener. Creator and host of podcast series "Língua da Gente," "Conversa Brasileira," "Tá Falado"
I directed the development of 42 units of freeware pedagogical materials for K'iche' Maya self-instruction. I created a free website called "ClicaBrasil: Portuguese Language and Culture to Intermediate Students"
Wrote "From MSA to CA: A Beginner’s guide for transitioning into Colloquial Arabic "
Created the entire curriculum for the course Elementary Spanish 1 for Health Professionals. Co-wrote the open French textbook "Histoires d'Avenirs". I coauthored "Español y cultura en perspectiva", a series of culture and reading units for 300-level Spanish students. Co-created an open course for Maya K'iche' that incorporates audiovisual materials. As the Langauges Facilitator at Parkway Schools, worked with colleagues to use OER to create thematic units for 5 languages. Part of a team that wrote "Empowering Learners of Spanish", a collection of activities based on Critical Pedagogies/Critical Language Awareness. An OER Creator is a student or teacher who creates or adapts a short OER, such as a single activity or lesson plan. Adapting an OER usually means revising a work or remixing several works into a coherent whole, in order to create a new derivative. All OER must carry an appropriate CC license. I create conversation lab activities for Korean 201 and 202 students. The lab activities are openly licensed and shared with other teachers. Developed and shared 360-degree virtual reality videos to be used in Italian language courses to promote cultural learning. I work to create unique copyright free speaking activities for Mandarin Chinese at the Novice to Intermediate level. To provide unique, copyright-free content for short instruction. I created openly licensed worksheets, a test, a quiz, and self-assessments for students. I shared these with students and colleagues. As an OER creator, I create activities that other American Sign Language teachers can use in their classrooms. As an OER creator, I have translated the activities from Spanish to English so that teachers across the country can use them. Created a dozen openly licensed Chinese speaking activities and shared through Boise State. Contributing novice level ASL conversation activities to BSU's group. I've created four so far, and have twenty-six left. I have been developing Spanish OER materials grounded in the multiliteracies pedagogy Learning by Design since 2016. Co-created, taught an OER lesson around the music video advertisement text "Is mir egal" in a first semester German language class. Used a lesson from the FLLITE project to teach first semester German students about the ways one can use public transportation in Germany. During a pre-semester teaching orientation, we developed a lesson plan using the FLLITE model to explore a music video advertisement. I mostly create my own lessons, which are aimed to bring relevant topics to the language classes. Taught my science lesson, “How does a caterpillar become a butterfly?” to 1st graders in the dual immersion program. I used a Sabbatical Leave to develop simple readings for Italian 101 and 102 students. An OER Master Teacher is an advanced user of OER who either adopts a large, integrated OER as the curriculum or combines several OER into a coherent curriculum. In this case, the OER are more important to the curriculum than the adopted commercial materials. I have collaborated with the creation of an OER website alongside the manager of the English Language Institute, Jenny Bourne. I adopted the OER website-based program for French Français Interactif, and I use it as my "textbook." I have adopted Français Interactif as the foundation for the curriculum of my French 1 and 2 courses. Develops quizzes, comprehension activities, and more using COERLL's Brazilpod materials. An OER Teacher is someone who uses OER primarily to supplement the adopted textbook that defines the curriculum and dictates the classroom activities. In this case, OER are used to update, amplify or improve some elements of commercially-produced materials found to be lacking. I use the podcasts Tá Falado, Conversa Brasileira and Língua da Gente for pronunciation and class discussion. Worked with an instructional designer to create a fully online OER course for heritage learners of Spanish. Course to be completed soon. I adopted Français interactif from @COERLL as the primary text in our 100-level courses & have been using it successfully for 5 years now. I use the Francais Interactif program as the basis for activities, vocabulary and grammar. With the French Department at Northern Illinois University, adopted Français Interactif as the main textbook for the first three semesters of instruction. Uses openly accessible online materials with German students at Santa Barbara City College.